The teams in the Cameroonian MTN Elite One 2012 have all played six matches of the new season. In this post, I will present all scorers so far in this exciting league. Four players are sharing the top goalscorer position, each with four goals: Midfielder Thierry Makon Nloga (born 09.10.1983) and striker Hermann Landry Tonye Hagbe comes from the newly promoted side New Star de Douala. Joël Moise Babanda (born 12.01.1980), the veteran playmaker of Union Douala, and promising attacker Alex Ngamou (born 15.01.1990) of Unisport FC are the two other players. Aimé Gerard Mangolo 3, Augustin Dourwe Taoga 2, Kelvin Agbor 1, Joseph Julien Momasso 1, Ernest Nsombo 1. Yazid Atouba Emane 2, Philippe Ngom Balonga 1, Joël Emmanuel Kofana 1, Alain Roger Ndjan 1, Frédéric Nguidjol 1, Own Goals 1. Jean Jules Bapidi Fils 2, Jusly Gitel Boukama Kaya 2, Didier Bassamagne Moundobou 1, Jacques Haman 1, Chardin Madila Mfoutou 1, Own Goals 2. Thierry Makon Nloga 4, Hermann Landry Tonye Hagbe 4, Tobie Julien Ebah 2, Hervé Guillaume Boumsong 1, Eboa Mbock Mbonjo 1, Roméo Yem Yem 1. Frankline Metuge 2, Joseph Marie Gaël Foé 1, Fabrice Kerdy 1, Charles Zeh Nghie 1. Ngampiep Vigny Kologni 2, Ronald Fogang 1, Gerard Pahane 1, Hamgue Armand Tchangue 1. Harry Ako 2, Chanabou Gassissou 2, Franck Hemmo Simo 2, Samuel Bitte 1. Pierre Fanguargue 2, Abdouraman Siddi 1. David Ambeno Ake 1, Alain Nkafu 1, Franklin Nougoum Ngassam 1. Joël Moise Babanda 4, Charles Edoa Nga 1, Jean-Paul Ekane Ngah 1, Vincent Mbarga Manga 1, Arnaud Monkam Nguekam 1. Alex Ngamou 4, Marcellin Ngando Mbiala 2, Barnabé Patrick Atangana 1, Charles Eloundou Etoundi 1, Kerrido Haschou 1, Charles Lobe Lembe 1. Jude Vernyuy Kongnyuy 2, Ekome Bwende 1. 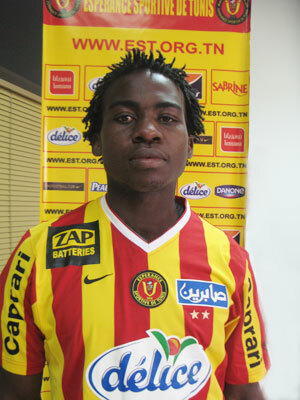 The picture is of Jean Jules Bapidi Fils, the brilliant midfielder of Cotonsport FC, and is taken from tunisie-foot.com. Herman Landry Tonye Hagbe has 3 goals and not 4.